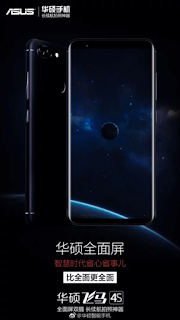 ASUS launched the latest smartphone with ASUS Pegasus 4S in China.There are no details regarding the pricing and availability, but the device will be available in Star Black and Gold colors in China.After Samsung launching its Infinity Display with Samsung Galaxy S8, then LG launched its first Full View display with LG G6 and many other manufacturers followed the bezel-less display trend and now we have the new device with FullView display with ASUS Pegasus 4S. ASUS Pegasus 4S is completely made out of metal.At the front, we have the bezel-less display with earpiece sensor and selfie camera above the display and no physical home button below the display which is no replaced with on-screen navigation keys.At the back, we have the Dual Camera setup with LED flash and fingerprint scanner below it.On the right, we have the Power key with Volume rockers.The ASUS Pegasus 4S is 8.8 mm thick and weighs 160 grams. 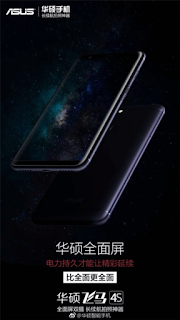 ASUS Pegasus 4S sports HD+ display having a resolution of 720*1440p with an aspect ratio of 18:9 and covered with 2.5D curved glass on top.The device is having nearly thin bezels on top and bottom of the device.It is powered by MediaTek MT6750T SoC clocked at 1.5GHz coupled with 3GB/4Gb RAM and 32GB/64GB onboard storage. At the back, we have Dual camera setup which is aligned horizontally and comes with 16MP and 8MP sensor combination.The dual camera comes with LED flash, AF, and Full HD video recording capabilities.There is 8MP selfie camera above the display.The ASUS Pegasus 4S is Dual SIM device with support for 4G LTE and VoLTE. All this is fueled with 4030 mAh battery and the device is running on Android 7.0 out of the box with the latest version of Zen UI on top.